My best friend is also my cousin, which was the best thing when growing up because whenever we had a family function I always got to hang out with her. Unfortunately, we don’t live fifteen minutes away from one another anymore, we are more like three hours apart. Luckily, a couple times a year we manage to get together for a visit. This past weekend I was lucky enough to have her come up and visit me. I try to make her one of her favorite breads every time I get the chance to see her, and this Olive Batard is that bread. It is an adaptation of my rustic baguette which is one of my all-time favorites. 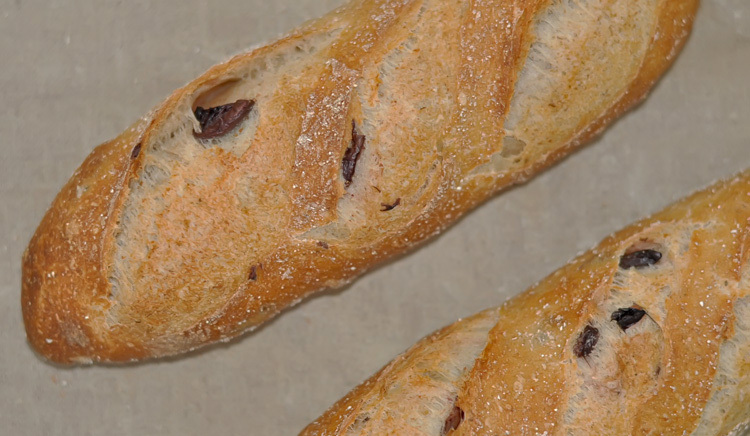 This olive batard is a crusty loaf that has a soft and silky interior, studded with salty olives. It pairs well with mild soft cheeses like fresh goat cheese or Brie. Combine together the levain and water into the bowl of a stand mixer. Add in the flours and knead for 2 minutes with the dough hook. Stop the mixer, scrap down the sides and cover the bowl with plastic wrap. Allow the dough to rest or autolyze for 20 minutes. Add the salt to the dough and knead on low speed for 12 minutes. The dough will be smooth and elastic. Add in the chopped olives and turn the mixer on low speed for just a couple minutes. You may need to turn the dough out onto the counter and knead by hand to properly incorporate the olives into the dough. Place the dough into a lightly oiled bowl and cover with plastic wrap. Allow to rise for 1 hour. After 1 hour turn the dough onto a very lightly floured counter and give it a business letter fold. To do this you gently stretch the dough out into a rectangle and fold it into thirds then turn the dough 180 degrees and fold it into thirds again. Place the dough back into the bowl with the seam side down. Cover with plastic wrap and allow the dough to rise for another 1 1/2 to 2 hours. The dough will have swelled considerably, but may not have doubled in bulk. Preheat your oven to 475 degrees with a baking stone set on the center rack and a cast iron skillet set on the bottom rack. Turn your dough out onto a lightly floured counter and divide it into 3 equal pieces. Pre-shape the pieces into rounds. Allow them to rest covered with oiled plastic wrap for 10 minutes. Then working with one piece at a time, turn the piece of dough smooth side down onto the counter. Gently press the dough out into a small rectangle. Fold the bottom third to the center and press to seam it. Then fold the top third to the center and press to seam it. Finally fold the piece of dough in half and press firmly to seam. Starting in the center apply gently yet firm pressure to the dough and rock it back and forth. Then work your way out towards the ends. You want the batards to be about 12″ long. Repeat with the remaining two dough balls. Proof your shaped batards in the folds of a floured couche or parchment paper that has been lightly oiled and floured. Let them rise for about 60 minutes unless your kitchen is particularly cold then they may take an extra half an hour. Transfer your risen batards to a sheet of parchment paper using a flipping board or your hands. Score the tops of the loaves with three diagonal slashes. Quickly transfer the loaves to your preheated baking stone and pour a half a cup of water into the cast iron skillet. Quickly close the oven door and bake for 20 minutes or until they are a golden brown color and sound hollow when tapped on the bottom. An internal temperature will read at 205 degrees. Allow the loaves to cool on a wire rack for at least one hour before slicing. These loaves taste best the day they are baked, but they can be wrapped in aluminum foil and frozen for up to two months. Thaw in the foil at room temperature then re-crisp for ten minutes in a 350 degree oven.